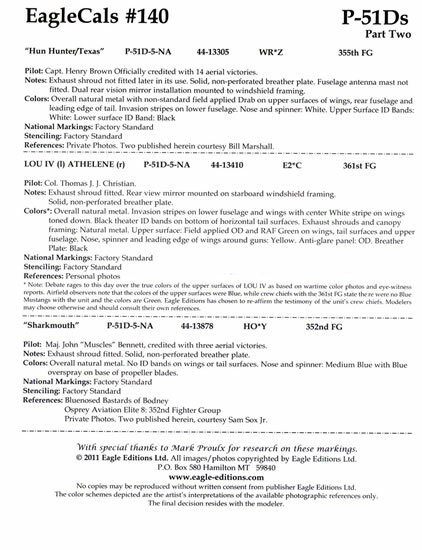 This sheet provides you with markings for three UK based 8th Air force early P-51Ds without the dorsal strake. 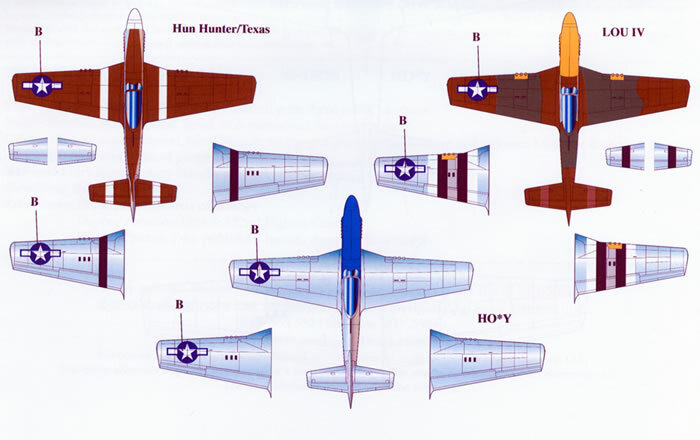 P-51D-5-NA serial number 44-13305 “Hun Hunter/Texas” flown by Captain Henry Brown of the 355th Fighter Group’s 354th Fighter Squadron. Just why this machine is referred to as “Hun Hunter/Texas” is a mystery to me as I can find no images of it wearing that name. 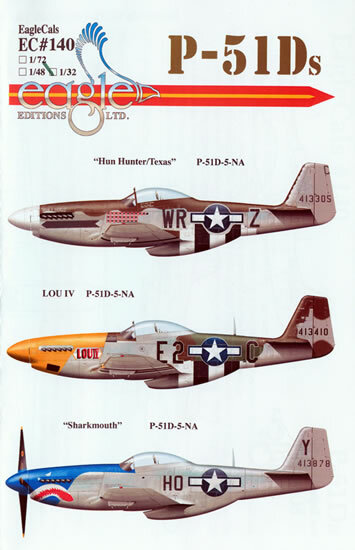 Captain Brown’s P-51B serial number 42-106448 however did carry the name so maybe it is a carry over from that. 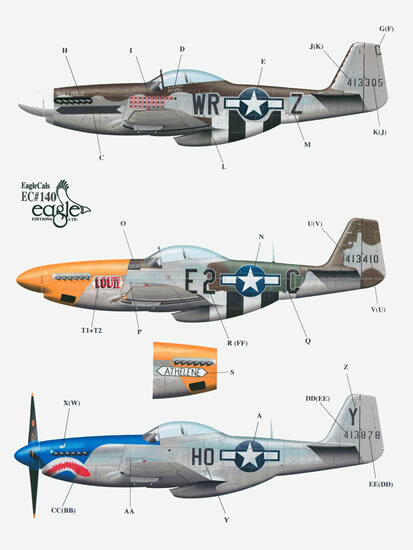 The only name the machine wears is ‘BULLDOGS” which was the Squadron’s tactical call sign in white lettering on the cowling above the exhaust stacks but again, I could not find an image of the machine wearing the name. The name DALLAS TEXAS however is worn in (small) white lettering on the canopy rail under the pilot’s name. The aircraft is in overall natural metal finish with its upper surfaces in a post-delivery applied olive drab. It wears white theatre identification bands around the wings and horizontal stabilisers. The remnants of its D-Day identification markings are worn on the underside of its fuselage. The spinner is in white as is the band around the nose. 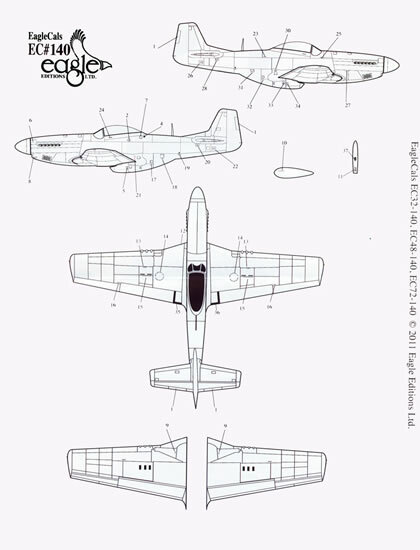 The decals for the fuselage national insignia are provided with a “silver” surround to save you the agony of correctly masking these markings. 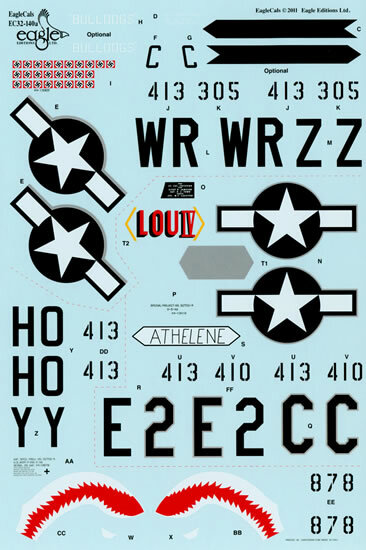 P-51D-5-NA serial number 44-13410 “LOU IV/ATHELENE” of the 361st Fighter Group’s 375th Fighter Squadron flown by the Group’s Commanding Officer Lieutenant Colonel. Thomas J. J. Christian. Let the seemingly never ending debate regarding this machine’s upper surfaces/vertical stabiliser camouflage scheme continue. It has been reported as being painted in blue, ranging from a bright blue to a deep royal blue or either US olive drab or even RAF dark green. Either way, the machine started out in natural metal finish with an olive drab anti-glare panel before the debated top camouflage was applied. 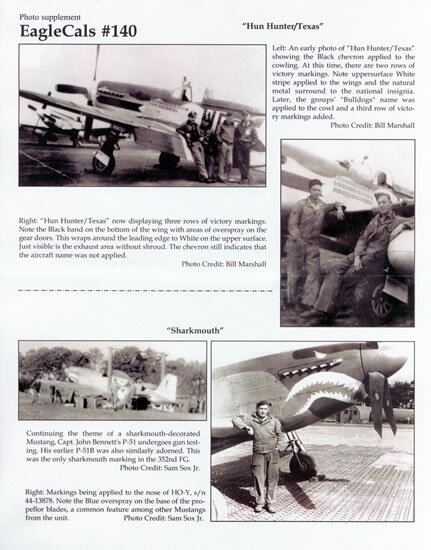 It wears Group markings of a yellow spinner and nose (the gun fairing panels on the wing are also in yellow) as well as black and white D Day recognition markings on the underside of its fuselage and its wings. The remnants of its theatre recognition markings are also carried on its horizontal stabilisers, black on the underside and white (lightly over sprayed) on the upper surface. The upper surface D-Day recognition markings on the wings and fuselage have also been over sprayed in (reportedly at least!) RAF green paint. 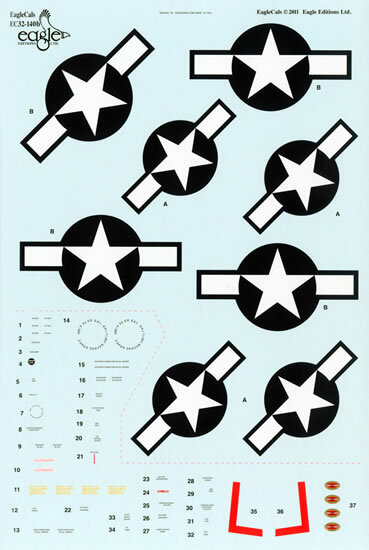 The decals for the fuselage Squadron identifying letters as well as the upper surface and fuselage national insignia are provided with a “silver” surround. The sheet provides comprehensive stencil data and national insignia is provided for all three machines with each option gets its own individual data block with the correct serial data block.